It is a challenge for many communities to successfully operate ecotourism without any outside support. It is also disheartening when a project fails because outside support mechanisms leave sooner than they should, often due to limited resources or idealism that communities needs ownership asap. Each community requires a customized approach if is to be successful ....a cookie-cutter approach just won't do! Laura Ell has over 16 years of experience in development, public relations and marketing for tourism destinations, community enterprises, parks and protected areas around the world. Currently, she advises Hummingbird Airlines (launching in mid 2014), the multi-award-winning Jungle Bay Ecolodge in Dominica and the Rwanda Development Board with public relations in East Africa (with Solimar International). Laura also partners with Joe Pavelka and Planvision Consulting supporting tourism development in and around the National Parks of Canada. In the past she has served as Director of Communications for The International Ecotourism Society. Through Solimar International Ms Ell helped implement marketing programs for Uganda Wildlife Authority, Uganda Tourism Board, Bocas del Toro in Panama and dozens of community tourism enterprises. Laura Ell is currently completing her Master's Degree at Royal Roads University (Victoria, BC, Canada) researching best practices for indigenous-inspired spa tourism. She also teaches Ecotourism courses at Mount Royal University (Calgary, AB, Canada) where she earned a Degree in Ecotourism and Outdoor Leadership. Ms Ell is the recipient of the 2010 Horizon Award at Mount Royal University's Legacy Awards Ceremony. ECOCLUB.com: With such a multi-faceted professional and academic ecotourism experience it was very interesting to hear in one of your videos that you discovered Ecotourism via the Dental Industry! Would you please explain this unusual path! Laura Ell: Yes, I know it was a surprising route to ecotourism. I studied dental assisting when I was younger and after a couple years of working in Canada I was inspired to move to Sydney, Australia for a year to work as a dental assistant. It was loads of fun and between work assignments, I would take weeks off at a time to explore Australia's culture and natural wonders and later worked for a hotel off the Great Barrier Reef. After country hopping a little more, I went back to Canada but my travel craving was not satisfied, so I sought out other dental jobs abroad and simultaneously began to study ecotourism through correspondence. It was then that I was offered a job in the UAE working at the Royal Family's Dental Hospital. As surgical assistant to Dr. Tawfighi we conducted the first dental implant surgery in the Persian Gulf (now I'm dating myself). In the 1990s, there were few ecotourism operators in the region and many hospital staff wanted to explore areas that were "off the beaten path" on their days off. I began offering regional ecotours along with a partner to turtle and whale watch, camp and arrange cultural heritage encounters with the Bedouin peoples of Oman. While based in the Middle East for those two years, I also got the opportunity for sojourns in 20 nearby countries. On one of those trips I was especially troubled by some of the unsustainable tourism practices in the Annapurna's of Nepal, where local residents were on the receiving end of significant negative social and environmental impacts. This life-changing experience inspired me to become more committed to ecotourism, so I left the dental-assisting world. Looking back, there were a number of occasions where I questioned how my career path was taking such a roundabout direction, but then I would hear my mother's voice in my head saying "everything happens for a reason;" --sure enough it always made sense later as various people and situations were indeed part of how I grew professionally. ECOCLUB.com: Having successfully served the ecotourism sector in many countries and at many levels ranging from small local businesses to destination management organisations and international associations, what advice would you offer to graduate job-seekers that want to follow your example but are unable to find a suitable position? Laura Ell: I would encourage recent graduates to network and volunteer as much as possible in areas that interest them. Since more and more tourism programs are offering sustainable and ecotourism programs, there is greater competition for job-seekers, therefore we have to learn how to highlight our attributes as professionals, much like how we help our tourism clients highlight their unique attributes through marketing. It is critical to have a well-rounded understanding of the sector, find a geographic or thematic focus (e.g., business, conservation, wellness, marketing, PR, cross-cultural relations, etc.) where there is industry demand, and then start to gain experience in and become known for focusing in one these niche areas as a professional. The focus may morph into other areas over time but it helps you have a unique fingerprint amongst other graduates. I would add that the tourism and hospitality industry is not a 9-5 cushy job and the more hard work you put into it, the more you get out. Yes, travel is exciting but there are lots of challenges that come with many international assignments and if you are willing to put yourself out there and make some sacrifices, the number of opportunities increase. For example, I walked through a Kampala slum everyday on my way to work for one particular project and although it was very different from the areas we marketed for tourists, encounters like those open your eyes to the host community's needs, and how life in the Western world is so much easier. It helped drive me to ensure my efforts were meaningful. While consulting abroad, one must be resilient, hard working, compassionate and well-informed. Another tip is to be willing to go into destination and communities and help them facilitate their goals rather than only prescribing textbook solutions. It also helps build trust with local stakeholders when you are unpretentious, and share your knowledge of ecotourism models relevant to their challenges. One of my mantras is to "keep your finger on the pulse of ecotourism trends"... sign up for the ECOCLUB.com and other key industry newsletters, subscribe to Google Alerts, and learn from as many business and destination models as possible (successes and failures) to apply lessons-learned to your work. Trying to see issues from a new perspective, and being open to values from the local community perspective will go a long way in helping them achieve their goals. ECOCLUB.com: Among your many successful projects, you helped (and are still helping) a small, little-known resort in Dominica to get noticed by major newspapers and win prestigious awards. Small business owners are obliged to know a little bit of everything and thus tend to have strong opinions about everything. What were the key elements of the successful cooperation with the owner in your case? Laura Ell: Indeed it is a challenge for small enterprise owners to have to be jack-of-all-trades in order to achieve success. A few of the key attributes I have noticed with operators of leading small eco companies is they are tenacious visionaries. They see the "beyond" while naysayers say it's impossible. They are resourceful and work with limited means in remote locations. In the case of Jungle Bay Dominica, Sam Raphael is a businessman and social activist with a background in tourism and development, but he recognized where he had gaps and surrounded himself with experts where needed. For example, he invited me down to help with ecotourism components, travel philanthropy, marketing and public relations; rather than send food and beverage staff away for hospital training he invites chefs to the resort annually to keep kitchen skills at an international level; his wife went to the US and became trained in massage-teacher training to train the spa staff on site; and he brought in an international tour operator specialist to connect to leading international nature-based trade. I believe the key to success in working with clients like Sam is going in and spending time in the destination, speaking to community members and walking around the property before jumping in with recommendations. Those initial impressions are important, however, not all of our ideas and approaches are suitable for every project. A business partner and mentor, Joe Pavelka, taught me to ask "what if we did nothing" while sitting in a town square, speaking to taxi drivers or chatting to housekeepers. When they think about what their community will look like in 20 years continuing on a path without ecotourism (which often entails unsustainable development) versus an ideal ecotourism development scenario, they will explain some of their concerns about the social and environmental degradation that they see on a daily basis. I find this to be a simple yet very effective means of gleaning information and understanding to help design informed recommendations. For me this is essential to building rapport with owners and communities. ECOCLUB.com: Awards and fame usually bring higher-rates and high expectations and there is a danger of alienating the types of hotel guests that appreciated them and helped them succeed. It is not unheard of for multi-award winning Lodges to go into receivership. How important and how easy is to manage and preserve success? Laura Ell: It is incredibly important to maintain success, but as to how easy it is, that is another story. Continued prosperity is especially key for the sake of the community around which the lodge operates. 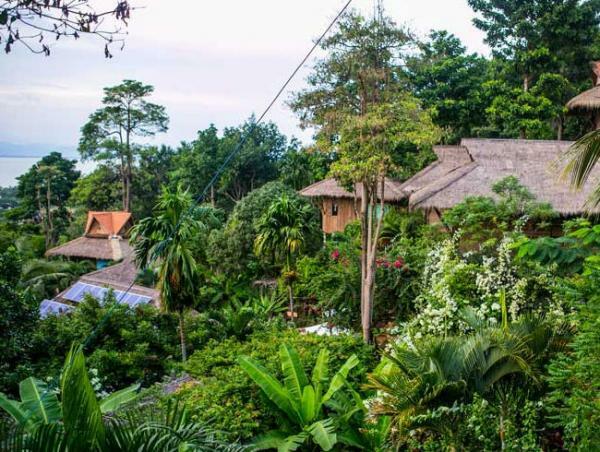 The property has most likely created a local micro-economy by offering jobs, purchasing local produce as well as other goods, and overall expectations that conservation and social improvement will continue. If the lodge fails there is a trickle down effect, which lets down many beyond the owner's bank account and direct lodge staff. If the downturn is caused by the attempt to shift to a more upscale clientele they will soon learn it is not a sustainable choice in the long-term. The lodge owners should take any awards and PR credit with all partners who made it possible and keep a humble approach to maintain the guests and sustain the business. In some cases, the lodge owner builds the success story then sells the project to any willing buyer who does not embody the same philosophies, thereby attracting different clients. Or as you say the property evolves to be more upscale and attracts an ill-matched target market. Eco travelers are quite astute and pick up on the vibe of a property if it is changing then they move on to frequent a new property. Therefore it is important that the guests continue to maintain the same personal connection that they had before the awards. It may also mean maintaining the core product but introducing a few upgrades or new elements from time to time to keep it relevant for the repeat guest. In saying all of this, ecotourism is very complex with a blend of internal weaknesses and external threats that are also likely at play with a lodge on the brink of bankruptcy, beyond a changing target clientele. Although a successful project is very gratifying, operating ecotourism is not for the faint of heart so in addition to the business side of the operations, there are so many additional and unexpected logistical challenges that face a lodge in a remote destination. Laura exploring architecture and handcrafts in the UNESCO World Heritage Site of Old Stone Town, Zanzibar where Swahili African, Arab, European and Indian cultures collide offering a unique backdrop for coastal ecotourismECOCLUB.com: Based on your experience, do you feel that destination marketing & management organizations are becoming more or less relevant in terms of developing Ecotourism? Is it true that they are doing a great job if the tourist does not get to notice them? Laura Ell: I believe DMOs most definitely continue to be very relevant, however there is need for a major shift in the approach most of them take. Unfortunately, the trend in developed destinations seems to be much more focused on marketing, and less on managing the destination, to ensure that over time they will be able to preserve the very attractions they are promoting. In some cases they are marketing a pristine exotic destination, which on the ground, is not as postcard perfect as the brand promises. However, there is hope. A growing number of emerging destinations are seeing the value of sustainable destination management going hand in hand with marketing. They have a unique opportunity to "do it right the first time" compared to their overdeveloped counterparts who are trying to repair the wreckage after too many years of mismanaged mass tourism. I am fortunate to work with Solimar International where the CEO, Chris Seek, is very passionate about this point. Solimar's philosophy is designed around these issues of helping destinations meet their goals of triple bottom line sustainability which brings meaningful economic growth: environmental protection, socio-cultural growth, and economic growth. Many destinations are also stuck in traditional marketing mentality of dropping money on major international TV channel spots and magazine ads, while the consumer is more willing to be motivated to book through attracting the inbound market via Internet-based content sharing or leveraging traveler reviews. ECOCLUB.com: You are currently researching wellness and indigenous spa therapies as part of your Masters. What attracted you to this particular topic and in what key ways should an eco spa differ from an ordinary spa? Laura Ell: My passion in this niche area converges from a number of experiences over the years. Perhaps it began around the first exposure to Martha Honey's research in indigenous rights and responsibilities while working at TIES. At times, I was becoming overly passionate about my work, which led me to long hours of work with inadequate rest. As a result, I burnt out a couple of times. Natural healing modalities like local spa treatments helped me recover from these stresses. My perspective about spas as only being frivolous changed and I now appreciate the many natural healing methods that humans have using throughout history. They offer a wide variety of stress management and health promotion options, especially as our global society has shown a steady increase of stress and anxiety. In addition, this is an era where traditional cultural practices are slowly being discontinued and lost. With careful planning and a sense of responsibility we need to create a means of preserving these traditional practices and brining economic growth to communities faced with less sustainable economies. I see opportunity for development of best practices to help showcase model projects to ensure communities and cultures are not exploited while the wellness industry booms at a rate of 40% annually. You can see more at this infographic: http://indigenous-spas.com/ If any ECOCLUB.com readers out there have experience in the area of culturally inspired spa and wellness please email me at lauraell [at] me.com and I would love to include your input in my research. Equally, if you know of a model culturally inspired spa or expert please let me know. ECOCLUB.com: You are certified as a Reiki practitioner. In what way has this philosophy & practice influenced your own approach/path to ecotourism? Laura Ell: Reiki is a traditional Japanese energy healing modality and the Reiki precepts, which are most aligned with my personal ecotourism approach, are to Be Humble, Be Honest in your Work, Be Compassionate to Yourself and Others. Intuition (listening gut feelings) is also an important part of my approach to work and personal life. Eventually, I plan to develop an Eco Wellness and Sport Medicine Center with my partner in Western Canada to bring other like-minded healers in the region together to share their talents. ECOCLUB.com: Through your work, have you developed (or lost) any preference for community & worker-owned ecotourism businesses? What could be preventing such businesses from becoming a more frequent phenomenon? Laura Ell: Although pure community-based and worker-owned projects are undoubtedly less common than we all would hope, there are hybrid methodologies that are bringing more empowerment to communities. I have learned over the years that community-based ecotourism is a great sustainable alternative to less desirable roads the locals may take such as turning to resource development which may displace them and offer little economic gain for local residents. It is a challenge for many communities to successfully operate ecotourism without any outside support. It is also disheartening when a project fails because outside support mechanisms leave sooner than they should (often due to limited resources or idealism that communities needs ownership a.s.a.p.). Each community requires a customized approach if is to be successful because I believe a cookie-cutter approach just won't do. In Uganda, Solimar International helped develop the award-winning Pearls of Uganda project. This was born out of the communities having challenges with international marketing exposure and operating logistics. After providing USAID-sponsored business training and product development, innovative partnerships connected community projects with more established privately-owned ecolodges and tour operators located near to them, to create a win-win relationship. The private sector can offer mentorship programs where neighboring communities can obtain support for their projects; community projects can piggyback off of marketing efforts; lodge operators have new attractive community products to keep their clients around a few more nights and communities can benefit from being supported to help increase quality standards and revenue. ECOCLUB.com: As a consultant, what is your evaluation of corporate social responsibility in general and how it is being used by mega- resort developers and multinational hotel chains? Laura Ell: Corporate Social Responsibility continues to be a hot topic in tourism. On one end of spectrum, there are always some major resorts and hotel chains using it to "greenwash" as a marketing advantage, but with little substance to their CSR initiative. It is not just tourism using CSR as a promotional tool. For example, BP spent more on their CSR campaign brand than they did on the actual CSR activities they were promoting! On the other hand, there are certainly notable tourism companies being to make more a contribution to CSR -- and so they should as stewards of destinations they bring guest to. Fairmont Hotels has been in the news in the past, however, we do not seem to hear much about their more recent good deeds. Bill Mariotte's leadership drives numerous CSR programs for the chain. Mega-resorts do get a bad rap for their un-eco ethos, often for good reason, however, when they have a greater number of guests stay with them compared to ecolodges, we should applaud them when they do good because it has a positive impact on the industry. Generally, there appears to be more growth in social and cultural CSR causes and a decline or stagnation in environmental initiatives. Consumers are also becoming much more savvy and are interested in seeing CSR info on the website and updates on social media platforms. At times, they even call out a company publicly on these forums when they do not think it is meaningful CSR. ECOCLUB.com: Ten years ago you published a research article in our website on the Solomon Islands and their potential for ecotourism. How has the situation evolved since then? Laura Ell: Sadly, I have not kept in touch with my colleagues at the Solimar Islands Visitors Bureau and the European Union project, since my time working with them in 2002 – the UN's International Year of Ecotourism. However, an increased number of ecolodges appear to be popping up throughout the islands (see http://www.visitsolomons.com.sb/eco-lodges) and their destination marketing efforts have also become more refined. Ecotourism in the region still has similar challenges of mining and logging threats. However, education and tourism growth and success in the region continue to give hope to communities as noted in the following article excerpt ventures: The President of the Guadalcanal Provincial Council of Women, Mary Bollen, says "Establishing eco all around Guadalcanal would bring peace, prosperity and change the peoples lifestyle of living, also create jobs for school-leavers, tertiary education students - that's what I've seen.... one village had been just about to sign a mining agreement, until they learnt they could make money through eco-tourism instead." (source: http://www.islandsbusiness.com/news/solomon-islands/3131/eco-tourism-ventures-could-change-lives-in-solomon/). ECOCLUB.com: Finally, as one of the earliest Members of ECOCLUB.com, what would you like us to improve and/or focus on in the coming years? Laura Ell: I want to applaud you for continuing to build ECOCLUB.com as a relevant and leading resource in our industry. Platforms such as yourself, TIES, CREST, STI, Planeta, each have strengths and a valuable place on the Internet. It is great to see you continue to hold your distinct niche. I would suggest that ECOCLUB.com can continue to focus on being the leading provider of ecotourism job postings, education resources and events as you have been. ECOCLUB.com: Thank you very much for your kind words and detailed replies. As proponents of mutual aid, we will continue to build this network with the participation and according to the needs of its Members. We certainly need to improve on many aspects of our work, reach more communities, find synergies with other initiatives that share our aims for an ecological & equitable tourism. We hope to do all of the above with the ongoing support of dedicated ecotourism activists, practitioners and academics like yourself. Great to read this article and learn about the different paths of Laura's journey in ecotourism. Thank you for sharing!